While it is now a grim cul de sac with nothing more than a plaque to offer, Church Lane must be one among the oldest streets in the city as it connects Kevin St to St Kevin’s Church. 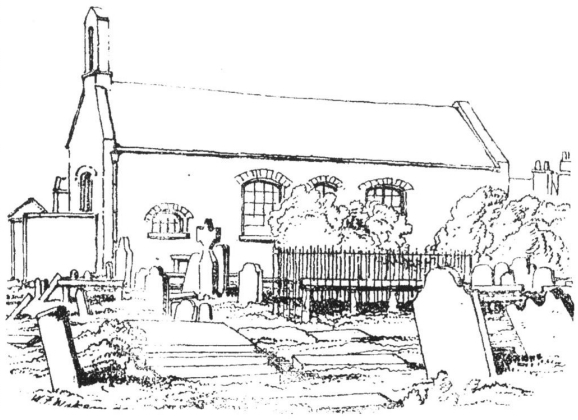 The church and graveyard, now cut off from the eponymous street, are currently only accessed by Camden Row. This is a pity. Some caution is required when hunting down Church Lane in the archives. The city had a few Church Lanes, unsurprisingly. Take for example Cathedral Lane, which we met on a previous article in this Kevin St series; it was previously Church Lane. 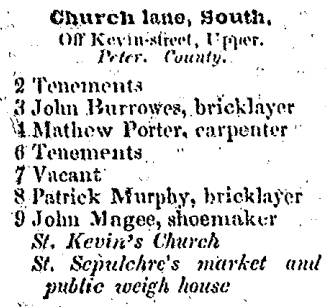 It seems the name Church Lane South was applied to our lane, and on that street in 1842, the occupants included John Burrowes and Patrick Murphy, bricklayers and John Magee, a shoemaker. Elizabeth Delap, a vintner who had been in No 3 in 1840, had disappeared in the two years since. An Ordnance Survey map from about 1838 show that there were just buildings on one side of the street. 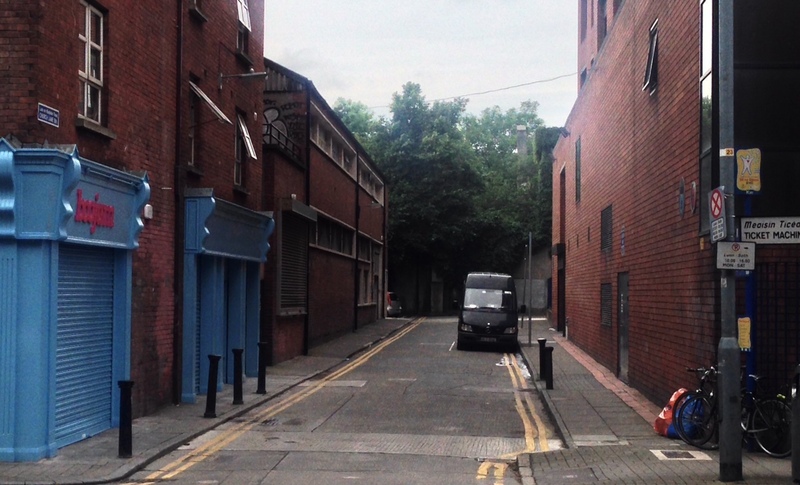 The other side, now DIT Kevin St, was the site of a Fringe Factory. The street ends with St Kevin’s Church, of course, but also mentioned is “St. Sepulchre’s market and public weigh house.” The weigh-master was one of the officers of St Sepulchre’s, responsible for ensuring fair weights for goods (which in turn may have had taxes levied). In general, this term was a modern incarnation of the Office of the Keeper of the Great Beam and Great Balance… That’s a disappointing amendment to the business card. 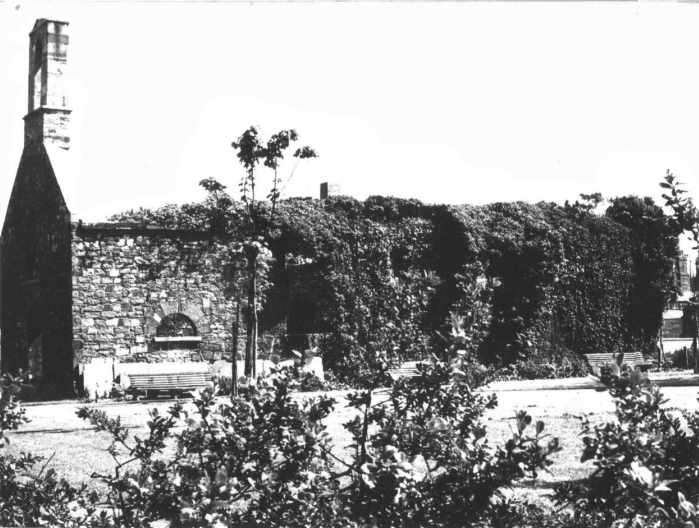 The Dublin historian Séamus Ó Maitiú has reported in detail the history of St Kevin’s Church, the destination of Church Lane. The earliest mention is in 1179. Kevin is in good company with two other native saints nearby; St Patrick’s, which obviously became the cathedral, and St Bridget’s, remembered now by Bride St. The church’s history thus spanned over 700 years, until 2nd April 1889 when the last vestry was held (Ó Maitiú, 2010). 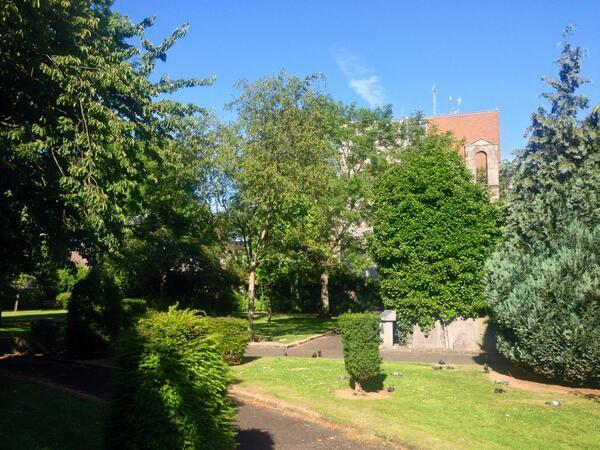 After the church closed, it was replaced by St Kevin’s Church on South Circular Road (Bloomfield Avenue). This tomb was erected by Mr Hugh Leeson of the city of Dublin Brewer for himself his posterity the 29th day of January 1685 and now beautified by his Son Joseph Leeson the 14th day of May 1741. Beneath are interred the following members of the family . . . Included in this list is Elizabeth, Countess of Milltown, who was the third wife of Joseph Leeson of Russborough, Co. Wicklow, the first Earl of Milltown. She outlived her husband by an astonishing 55 years! There’s an interpretative sign at the Camden Row entrance to the church and graveyard detailing other significant burials there. However I do think the grounds would benefit from having its original entrance reopened, at least during the daytime. It would rebalance the site in terms of connecting it to its original street and the opportunity to use the park as a thoroughfare might help deter the bands of daytime drinkers that make half the park unapproachable for most of the day. Parks with one entrance tend not to do well in Dublin. A moste pleasante parke, but for the drinkers. Séamas Ó Maitiú (2010) St. Kevin’s Church, Camden Row, Dublin Historical Record, 63(1), 39-53.